PEI Fest's Opening Night is Thursday, July 13 and includes and award-winning film, amazing entertainment, and delicious food and drink. RUMBLE: THE INDIANS WHO ROCKED THE WORLD will screen at 6:00 p.m. at Holland College's beautiful Florence Simmons Performance Hall located at 140 Weymouth Street. Individual tickets are available for $20. The screening is followed by our Opening Night Celebration at Confederation Landing Park at the end of historic Great George Street. 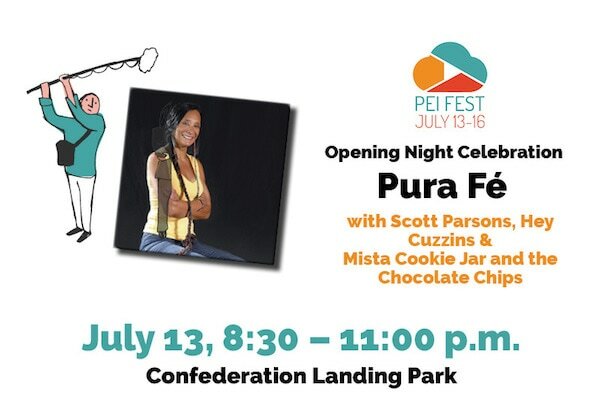 The event features indigenous performer Pura Fé, PEI's own Scott Parsons and Mi'Kmaq drum group Hey Cuzzins along with famous PEI Oysters, Upstreet Craft Brewing and locally sourced delectables created by Chef John Pritchard. Tickets to our Opening Night Celebration are also $20. Purchase an Opening Night Ticket Package for $30 which provide access to both events!